So the Shambles have been travelling again! 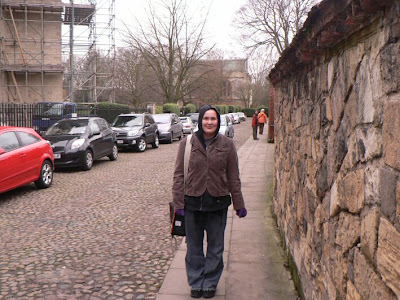 We spent the Christmas holidays in Bradford and we went to York (the old one not the new one). 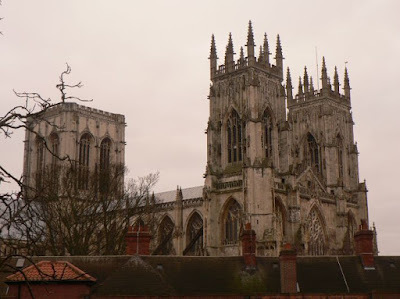 York is a small town that was originally settled by the Vikings hundreds of years ago. 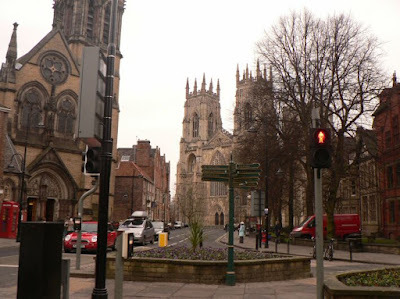 There is a HUGE cathedral there called York minster which is very Gothic looking and cute little cobbled streets and lots of bendy houses. (for those of you not in the know a bendy house is a building that looks like it is defying architecture and gravity by staying up). Also in York is . . . . The Shambles! (I'm serious) there is a street called The Shambles and another one called Little Shambles. 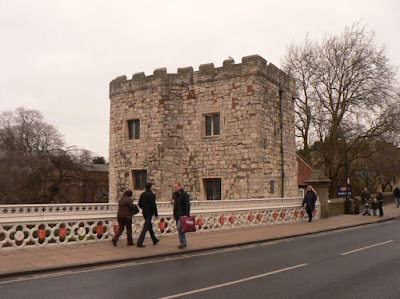 But the best thing about York (well at least I think so) is that the town is surrounded by a city wall which you can walk on. We got a great view of the city from up there. From now on I have decided that the city I will one day own will also have a wall built around it. 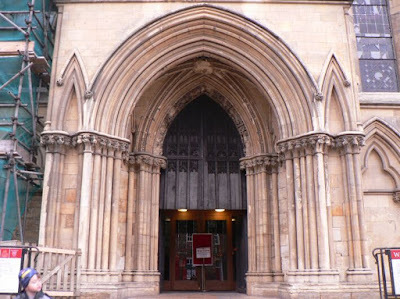 Anyway here are some of the sights from York. 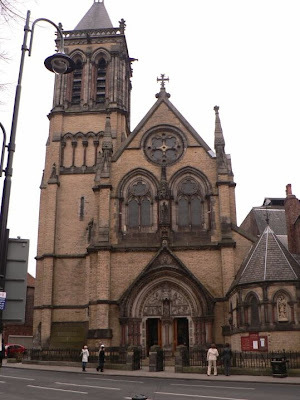 As you can see from the photos this town is a mixture of new and old architecture. 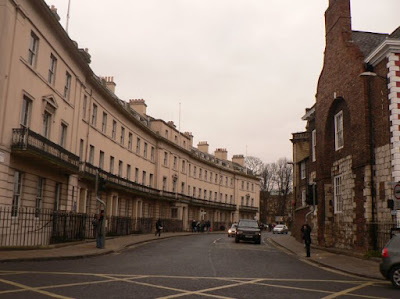 buildings have stayed the same and the city has grown around them with modern roads and street lights etc. 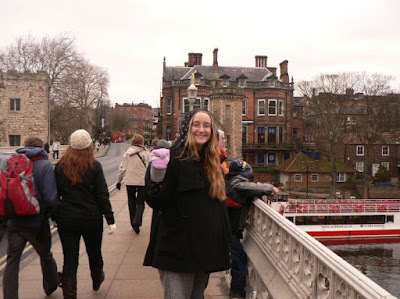 Also I should mention that it was VERY cold the day we came here which is why we are so rugged up in the top two photos. 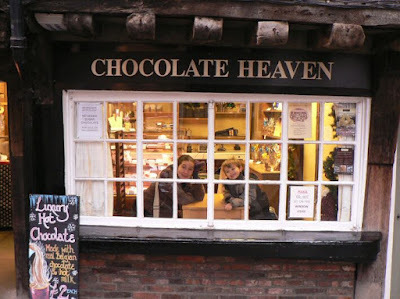 As it was so cold on this day we went to a tiny little chocolatiers which made real hot chocolate drinks which was a good way to warm up both our insides as well as our hands. In other news, we have finally moved into our new flat. So far so good. Mel and Mike have been fantastic, they helped us to move all of our stuff and they took us to Ikea so we could buy some stuff for the new place. We now have things like sheets a duvet. Also as our new room only had a bed and wardrobe in it we were able to get a desk and some bedside tables. Amber has had to work at the theatre today and I have spent most of the day unpacking and arranging our new room, I am very tired. Amber is back to her other job tomorrow. Anyway I hope everybody had a good Christmas and a happy new years on the beach/having a BBQ/getting sun/enjoying the outdoors. We have been having extra cold weather for the last few days and the forecast is saying there might even be some snow tomorrow. Unlike Bradford, We were hoping for a white Christmas and as it is colder up there than down here there was a chance that we might have had one but it did not snow until 2 days AFTER we left. So far the snow seems to be eluding us.